With a wealth of experience in the design and fabrication of custom crane systems, at Overhead Crane & Conveyor Services, we can provide innovative material handling solutions that reduce project costs. For the project highlighted here, the customer wished to invest in a more robust crane system that would allow them to target specific fabrication projects. Previously, we had only provided service work for their existing crane equipment. However, as a result of our reputation for full service, quick response time, and the quality of our work, they contacted us for advice on this new project. 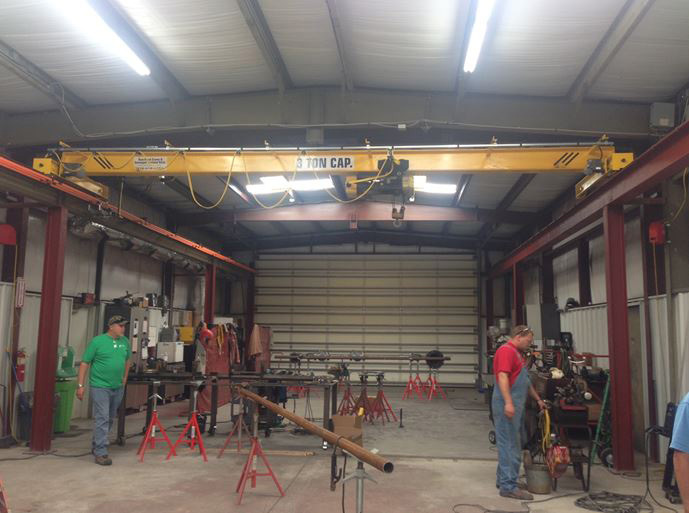 We were able to integrate the customer’s existing three ton monorail hoist and “S” shaped monorail beam into the new system in order to decrease the cost, providing them with significant savings. Flange stiffeners were added to the old monorail beam, and a new eight-button pendant was installed to control the new bridge pendant and bridge crane. We needed to take uneven flooring into account, which existed from the old part to the new part of the building. Functional testing was performed to verify the operation of the new system. By integrating new equipment with our customer's existing equipment, we were able to create one cohesive system for this customer, maximizing the hoist headroom with the existing structure and configuration. This solution provided the customer with a comparably inexpensive new system that allowed them to take on the jobs they were seeking without a high initial capital investment. The customer was very satisfied with every aspect of the new system and the budget we were able to maintain. They appreciated that our crane system increased their productivity, and have since asked us back for additional projects. For additional details regarding the custom crane upgrade and fabrication project, see the table below, or contact us directly.